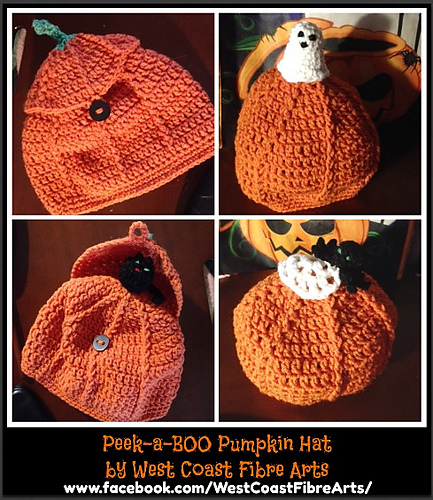 Introducing the Peek-a-BOO Pumpkin Hat pattern… just in time to make some for the Littles in your life, to keep them warm this fall! 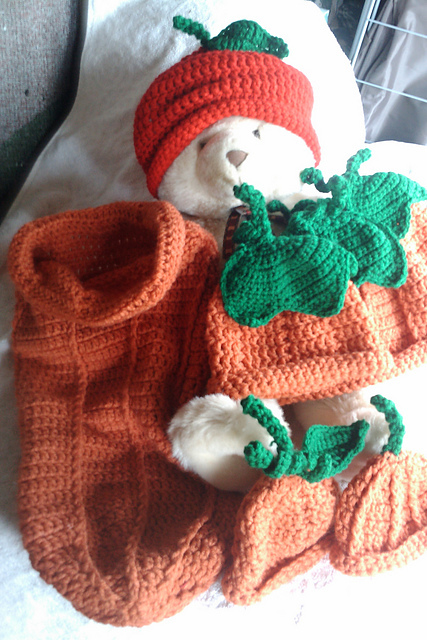 Perfect for visits to a Pumpkin Patch, fall craft fairs, walks in the park to collect bright fall leaves. They work up quickly, using aran or worsted weight yarn and a 5mm hook for the hats–use a 4mm hook for the little Topper cat, ghost, and spider. The Toppers look cute in place of a pom-pom on any fall hat, or make them for little pocket pal toys–great as cat toys, too! The Thanksgiving Pumpkin Hat has also been updated, and for even more fun I added another BONUS pattern in it! It now gives instructions to make 2 sizes of Pumpkin Totes–perfect for Trick-or-Treat bags, or to carry little toys, or for your littles to carry their own purchases at fall craft fairs. until midnight tonight, Pacific Daylight Savings Time. 78 designs to choose from!! Please add to your ❤ favourites ❤ if you choose and ❤ one of my designs 🙂 Have a lovely day! And a sneak peek at the latest design which is almost ready to add to the store: the first in the Blossoming Shawl series! The Wild Flowers Mason Jar Posy Cosy pattern is available now, and for the first 24 hours there is a 50% discount, no coupon code needed…so until midnight on 1 May 2017 it is less than 50 cents! The Flowers and Leaves of the Posy which decorates the Wild Flowers Mason Jar Cosy are made from a 1927 design I found in an Australian newspaper. You can make it in any #4 Worsted Weight yarn–I used wool for the cosy in soft natural-dyed colours and Bernat Handicrafter cotton in the blue/purple/white. I used a 5mm hook for the cosy and a 4mm hook for the flowers and leaves. You can make it with a short handle or a long one so you can carry your drink hands-free by putting it over your head or shoulder. Very quick to make! The flowers and leaves can be sewn on or you can make them removable, as I did. To celebrate Earth Day I designed a little crochet coaster that uses up small odds and ends of #4 worsted weight yarn left over from other projects. I used 100% wool that I had dyed using wild flowers and plants, barks, and spices. Each coaster can be made with about 25 to 30 yards of yarn–the most any one row uses is about 4 yards. You will also need a wide mouth mason canning jar lid to insert between the two halves. on Ravelry right here: Wild Flowers Coaster. When the promotion is over, the pattern is just $.95 Canadian to help me cover expenses. There will be another Wild Flowers pattern published tomorrow night, and it will also be free for 1 day only 🙂 Watch here on the blog, or on the Facebook page for the notice and coupon code. Over the summer I have been working of a series of Afghan Squares which have flowers at the centre and are based on Victorian era stitch patterns, ‘antimacassar’ motifs, etc…so I am calling it the Victorian Flowers Afghan. Instead of waiting until it is complete and offering an extra Bonus design, I decided to offer the Bonus to start with! Not only that, but this square includes instructions to turn it into a handy Project Bag…or shopping bag, or gift bag, or any other useful purpose. You can use the instructions to turn any afghan squares into a bag. The beginning Bonus pattern is free, and I’m posting the instructions in a series on my 2 Facebook Pages: West Coast Fibre Arts and The Ravelled Hank of Yarn. When the project is complete I’ll make a pdf file available in my Ravelry Store that has the whole pattern gathered together. NOTE: Beginning Part 2 Round 6, ch1 then begin the round; at the end of the round, join with a slip stitch to the first sc. Rounds 7, 8 & 9, please CHAIN 3 AS THE FIRST DOUBLE CROCHET; at the end of the round, join with a slip stitch into the 3rd chain. Round 8 corrected– *10dc, dc inc, hdc inc, hdc, hdc inc, 2sc, sc inc, sc, sc inc, 2sc, hdc inc, hdc, hdc inc, dc, dc inc, 2dc; repeat from *. I am using a 5mm hook and aran weight yarns to make my bags: Patons SWS, Red Heart SuperSaver, etc. I do not have a total amount required yet because I am sharing the pattern as I design it. I am estimating 12 to 16 ounces of yarn, but I really can NOT guarantee how much it will take until my bag is finished! Options are to make the bag using more than one colour, as I am doing with the Patons SWS bag that illustrates the Instructions: I worked Part 1 in their Soy Wool Stripes, which has long colour changes; then for Part 2 I switched to Soy Wool Solids, in green. Part 1 used 1 ounce, Part 2 used 2 ounces. Don’t forget, though–for a bag, you have to make 2 squares plus bottom, sides, and handle! I will update the amount of yarns used when I finish each part. The discount will apply at checkout. I’ll also be releasing new patterns that will be perfect for quick Christmas gifts or to make for yourself and your family–keep your eye out for them, they’ll be here in a few days! There will be an exciting, fun new Pokemon Inspired pattern later this week, and The Crunchy Carrot Market Bag is will be in the Pattern Store this weekend. Slippers, socks, a scarf, a washcloth/soap sack spa set, toys…lots of new designs coming in September, as well as a MYSTERY CROCHET-ALONG and KNIT-ALONG! If you need more inspiration meantime, you can check out the Interweave Store! Save 30% on hundreds of crafting resources. No coupon needed. Sale runs now through 9/5. Some exclusions apply. In addition, be sure to also check out the just released Atoll Cowl Kit. It is on sale, too, and the link is on the right, just below the “Interweave Store” tab.